Sold! 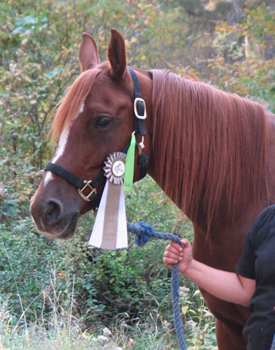 Congratulations to Kristen – Good Luck Daisy in your Upcoming Endurance Career! Mark is riding Daisy here and having fun playing brildleless, August 2014. I took her out of the pasture after she had spent the year being pregnant and raising her baby, very little handling and no rides for a year, and made this video. With weekly or more frequent riding she becomes super soft, even more quiet, and can perform her lateral work on a dime with completely invisible cues. This is raw Daisy fall 2013. Daisy stands 15 HH, has lots of bone, and great movement. She loves having a job and is extremely connected to her rider. She prefers to cover ground and go somewhere. While she is not the horse for a beginner, she does not require a perfect rider. She just needs somebody confident, soft, and understanding yet insistent and firm in their command. She is perfectly suited as a distance competitive trail horse or a shorter distance endurance horse. She loves to see new country and has a competitive spirit that keeps her going well past being tired. 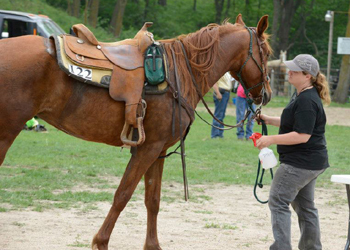 In 2012 she packed Summer on two NATRC CTR rides, the NE-KOTA Turkey Trot and the Indian Cave CTR. She placed well in both rides and trotted out for checkout exactly the same as she trotted for check in. She packed around 228lbs for both of those rides, all tack and rider included in weigh in. Her P&R checks were all good and she was not held for any reason during the rides. She rode both rides on a loose rein in the bosal and works well this way. She has an occasional spook or naughty episode but she is never trying to get out from under her rider. She takes very good care of her rider. 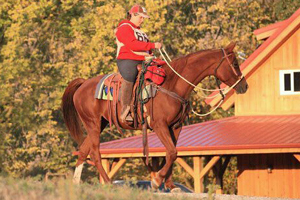 Despite her hotter temperament, is a very good horse to take on the trail guiding inexperienced horses/riders; she will fearlessly block horses running off down hill or charging off from their riders. Give her a job and she will perform. Daisy had a lovely filly out of Phantom of Chacaro in June 2013 and will be available once the foal is weaned. She is a wonderful mother and foaled without assistance. Daisy is offered for sale for $2000.00. She is breeders sweepstakes nominated with the Arabian Horse Association. An appropriate, great home is a must with this mare.